I had seen some pictures before, but when I got there and saw it alive it was breathtaking. This is Thaipusam, an important holiday for the Tamil-speaking Hindu community in Singapore. I think it is the most impressive celebration I have ever attended. I spent 3 hours at the Sri Srinivasa Perumal Temple, where they were getting ready for their journey, and had the chance to see the whole process of preparation. Everybody was really nice, allowing us (there was a lot of people taking pictures) to approach the worshipers to take good photos. There were also many people playing music, and friends and relatives talk and sang in order to support and encourage them during the piercing process. Of course, it takes years of practice until they can wear the big kavadi-burdens, and none kind of anesthetic is applied, although they get their body ready for it. A week later (as always I have some delay in posting...) I am still "in shock". Ya habia visto fotos antes de ir, pero cuando lo vi en directo fue mucho mas impresionante. 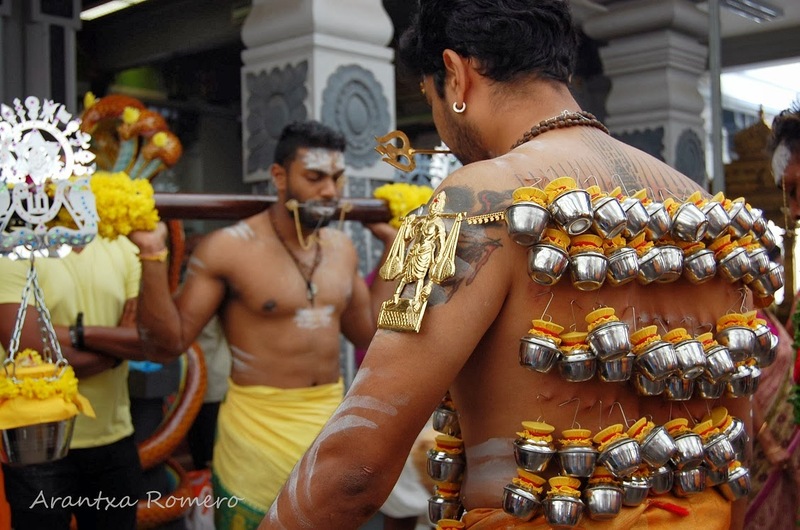 Es Thaipusam, una importante fiesta religiosa de los Hindues Tamil-hablantes en Singapur. Creo que es una de las celebraciones mas impresionantes que he visto. Estuve 3 horas en el templo Sri Srinivasa Perumal, donde se preparan para la procesion, y pude ver todo el proceso que requiere la preparacion. Todos fueron muy agradables, y nos dejaban que nos acercaramos a ellos para hacer mejores fotos. Una semana despues del festival (como siempre voy con retraso...) estoy todavia en "shock"